So many things can go wrong with your knitting if you don’t meet the gauge specified in your knitting pattern. Your sweater can be to small, or comically large. Your one skein knitting projects can turn into two skein knitting projects, dipping into your knitting budget. Your hat pattern sized to fit an adult can be suited only for a newborn. The first defense against ill fitting knitting project is to swatch for your project. Below I’ve written the key factors in creating a gauge swatch. If you’d like to read more about gauge please read my article on Gauge: How one project knit by two different knitters equals two different FOs. A story. here. 1. Locate the knitting needle, yarn and gauge information on your pattern. Size US 5/3.75 mm Knitting Needles, or size needed to get gauge. Yarn One 100 gram ball of Zen Yarn Garden Serenity Silk Single [75% Superwash Merino, 15% Cashmere, 10% Silk]. 774 yards/803 meters. Total yardage: 740 yards/ 710 meters. 28 stitches and 30 rows over 4 inches in Stockinette Stitch. 2. Cast on for your swatch. Using the above information that means you’d cast on 28 stitches with a US 5 Knitting Needle, a skein of Zen Yarn Garden Serenity Silk and knit 30 rows in Stockinette Stitch. If you’re concerned that you may not have enough yarn, instead of binding off the swatch try putting the end stitches of your swatch on waste yarn. That way you can undo the swatch if you need the extra yarn. 3. Soak your swatch in wool wash. I like Euclan but there are a few options available like Soak and Kookaburra. 4. Press your swatch dry with a dry towel. Do not wring the water out! That can damage the knit fabric. 5. Block your swatch exactly how you normally block your shawls since that’s how you’ll treat this one when it’s done! 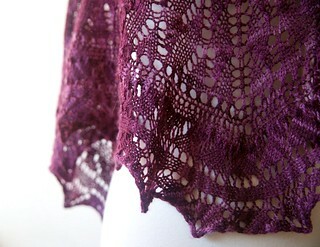 Read more about how to block a lace shawl here. From the Gauge information above your swatch should measure 4 inches from side to side and 4 inches from top to bottom. If the swatch is shorter than 4 inches repeat steps 1-6 with a larger needle. If your swatch is longer than 4 inches repeat steps 1-6 with a smaller needle. Row gauge can affect your yarn usage! You should do your best to get close to row gauge. If you are off and are soaking up more yarn than the stated gauge you could run out before your knitting project is finished. Something to keep in mind is that many knitters use up more yarn on a purl row than a knit row. If you want the finished item to be smaller try knitting with smaller yarn and needles. For example, if original pattern calls for US 9 Needle and Bulky yarn, try US 7 and Worsted yarn. Wash swatch and measure gauge. If you want the finished item to be larger try knitting with larger needles and yarn. For example, if original pattern calls for US 5 Needle and DK yarn, try US 7 and Worsted yarn. Wash swatch and measure gauge. If you like the fabric with a particular yarn and needle but the finished garment is too small, you can try knitting a larger size. 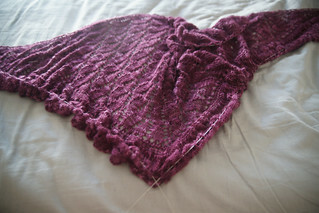 Or if the finished garment is too large you can try knitting a smaller size. For example if the pattern comes in (32, 34, 36) inch chest measurements and the size 34 is too small with your gauge, try the 36. If you knit the 34 inch size and it is too big, try knitting the 32 size. Special note: If you change yarns to a heavier yarn (i.e. go from sport weight to bulky weight) you will need more ease in the pattern. So go up a size or two. If you’ve tried different yarns and needles and just can’t get the right gauge you have the option of recalculating the pattern to fit the gauge you get with the needles and yarn of your choice. Your gauge is 5 st/in. The stated pattern gauge is 6 st/in. The hat pattern calls for 64 stitches cast on. Since your gauge is different but you want the same finished size, plug everything into the equation where x becomes the new number to cast on. Rearrange to solve for x. Round the answer down to 53 from 53.33. The hat pattern starts with a 2 by 2 rib. So the cast on number must be divisible by 4. 53/4 is not an even number, but 52/4 is even. Meaning it is divisible by 4 and will work with 2 by 2 rib. You can redo every pattern number in this manner, no matter if it’s a sweater, hat, or sock. The method works because it uses ratios and proportions. (Your Gauge*Pattern Stitch Number)/ Pattern Gauge = x. All you need to do is plug in the numbers for each section to solve for the new numbers based on your gauge. I hope that you’ve found my tutorial on How To Knit A Gauge Swatch informative! 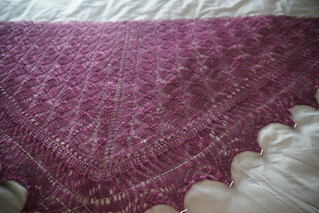 You may also be interested in reading How To Block Lace Shawls, Gauge, A Story, or Lace Triangle Construction. Interested in buying Michelle’s knitting patterns? Visit her online shop, ravelry shop, or etsy shop to buy one now. Each pattern purchased helps keep the lights on and gives Michelle time and resources to write more about knitting. Knitting Tin Hats since 2004. I wish I had read something like this when I first started knitting as gauge was such a mystery to me. Very clear instructions. Thanks for another great post! OMG You’re a…a….a GAUGE SWATCH KNITTER. I don’t know if we can be friends anymore. LOL Seriously, though, I kind of wing it with my shawls, because generally I buy WAY more yarn than I need, and I’m more worried about how it drapes and looks than how the gauge is. Sweaters, though…For clothing of any kind, I ALWAYS swatch. In fact, one of my knit group was making a baby sweater and she whined to everyone else I was being mean making her do a swatch. Everyone agreed with her that I WAS being cruel, until they realized she was knitting a sweater. Then they all agreed with me. LOLOL She was VERY disgruntled. I’m a swatch knitter. I found I have to be as I’m also a very tight knitter. Sometimes if it’s a scarf , shawl or washcloth and I have plenty more yarn than needed I’ll go up a needle size and wing it. I usually need to go up at least one size sometimes 2 if it is something fitted. Great post! I recommend adding extra stitches to the sides and rows to the top and bottom for a garter border, though, particularly with stockinette so you’re not fighting the curl to get measurements. I also love to compare my stitches and rows over 1″ with my stitches and rows over 4″ to see if there are any inconsistencies.